Pedro Morales has passed away at the age of 76, Cody undergoes knee surgery, UFC does a strong number on ESPN, Daniel Cormier extends deadline & more. **We have a huge edition of Rewind-A-Raw on the site with Wai Ting going through a busy day. On the show, we review Raw and the New Beginning in Osaka events, discuss Jay White’s IWGP title win, Kota Ibushi staying with New Japan Pro Wrestling, the Double or Nothing pre-sale sellout, the status of Mustafa Ali following Sunday’s house show in Fort Wayne, MLW Fusion moving to Saturday nights, the dates for the second Chris Jericho cruise, and we take your feedback at the end of the show. **Tonight, Wai Ting and I will be back with Rewind-A-SmackDown and the Double Shot for POST Wrestling Café members. On tonight’s show, we will review SmackDown and discuss the passing of Pedro Morales along with all of today’s news. On the Double Shot, I will be doing a review of the episode of Raw from June 17th, 2002 heading into the King of the Ring (which we are reviewing on Friday’s Rewind-A-Wai) and Wai Ting will be reviewing Total Bellas and the latest edition of Being the Elite. Both shows will be up early Wednesday morning. **Nate Milton will be joining us on the Café Hangout this Thursday at 3 pm Eastern to preview the WWE’s Elimination Chamber card and this weekend’s edition of The Rocky Maivia Picture Show. The show is available to watch live on Thursday if you are a Double Double, Iced Capp or Espresso member of the POST Wrestling Café. **Tickets are available for POST Wrestling LIVE in New York on Sunday, April 7th at Noon Eastern at the Broadway Comedy Club. Wai Ting and I will be hosting a 90-minute Q&A show followed by a meet-and-greet for those attending. Tickets are $25 and $20 if you are a member of the POST Wrestling Café. All the information and tickets can be purchased at www.postwrestling.com/live. 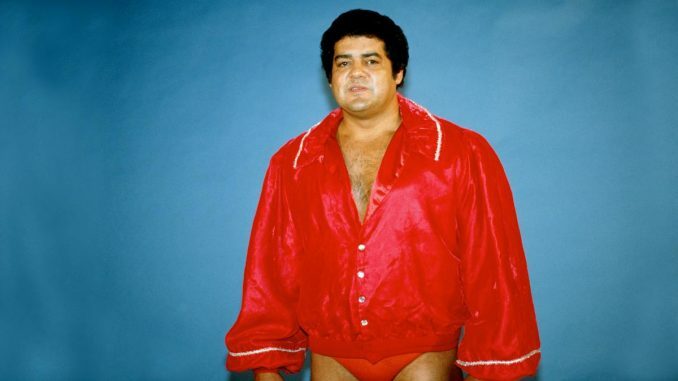 **Pedro Morales, who was a Hall of Fame wrestler and the World Wrestling Federation’s first Triple Crown winner, has died at the age of 76. The news broke Tuesday after a video was posted by Hugo Savinovich alerting the public of his passing. Morales was one of the WWF’s strongest drawing cards at Madison Square Garden while holding the WWWF championship for almost three years. After Bruno Sammartino stepped down as the promotion’s champion and dropped the title to Ivan Koloff, it was done as a brief transition to get the title on Morales who was able to draw the strong Puerto Rican audience in that part of the country. Morales defeated Koloff on February 8th, 1971 ending Koloff’s three-week reign. During this run as champion, he sold out Madison Square Garden 21 times, according to the research of Dave Meltzer of the Wrestling Observer Newsletter. Morales and Sammartino had a noteworthy match at Shea Stadium in September 1972 with Morales defending the WWWF championship. The two fought to a draw that was billed as 75 minutes but believed to have been a bit shorter. It was the first of three cards the promotion booked at Shea Stadium with future events in 1976 and 1980. The former was saved by Sammartino coming back way too early from a neck injury to face Stan Hansen on the card where the Muhammad Ali vs. Antonio Inoki match from Tokyo would air on closed circuit. The 1980 show was the culmination of the huge feud involving Sammartino and his former protégé Larry Zbyszko. After the promotion was able to convince Bruno Sammartino to have another run with the title and acquiesce to the demands of Sammartino, Morales dropped the title in a similar fashion where Stan Stasiak was the bridge to get the title from Morales to Sammartino in late 1973. Stasiak had a nine-day title reign defeating Morales in Philadelphia and dropping it to Sammartino on December 10th at Madison Square Garden. Morales returned to the WWWF in 1980 but would be lowered down the card and was given the newly formed Intercontinental title in December 1980 where he defeated Ken Patera. Morales would drop the title to Don Muraco in June 1981 and won it back in November. The second run lasted over one year with Muraco winning it again in January 1983. Morales received his first big break in California working for the WWA and winning their heavyweight title twice. This was when the WWA time was recognized at a similar level to the other major U.S.-based championships. He won his first title in March 1965, flipping it to Luke Graham that year and winning it back before losing it to Buddy Austin in August 1966. Morales held their version of the tag titles with several partners, including Luis Hernandez, Ricky Romero, Victor Rivera, and Antonio Pugliese. Among his tag partners, the most well-remembered would be San Francisco’s legendary figure of Pepper Gomez. Together, they won the San Francisco version of the AWA tag titles in April 1967 from Ray Stevens and Pat Patterson, who were considered one of the greatest teams ever. The two later won the NWA world tag titles in June 1968 from The Great Sasaki and Kinji Shibuya. Morales wrestled for Big Time Wrestling in Hawaii, the World Wrestling Council in Puerto Rico, Championship Wrestling from Florida and Japan. He spent his later years wrestling on undercards for the World Wrestling Federation during the national expansion years, including the 20-man battle royal at WrestleMania 2 in Chicago. His final match took place in 1987. Morales had been dealing with advanced Parkinson’s disease in his final years. He was inducted into the WWF Hall of Fame in 1995 and elected to the Wrestling Observer Newsletter’s version in 2017. **Cody underwent arthroscopic knee surgery on Tuesday in Atlanta. Cody had been dealing with this injury since November when he rotated his knee while throwing a t-shirt into the crowd at a Ring of Honor event. **Jay Lethal will defend the ROH title against Matt Taven at the promotion’s 17th-Anniversary pay-per-view event on Friday, March 15th in Las Vegas. **Total Bellas averaged 396,000 viewers on Sunday night after being off for one week due to the Super Bowl. It was their lowest figure of the current season and down 12.7% from the January 27th episode, which went head-to-head against the Royal Rumble. **Lilian Garcia recently interviewed Rusev and Lana for the Chasing the Glory podcast Garcia hosts. On this week’s interview, the couple revealed that they won’t be returning for the next season of Total Divas. The two had been told that the executives at E! loved the two and were even speaking about a spinoff series. According to Lana, there were new executives that came to the network and conducted a poll and the results told them that Rusev and Lana were very unlikeable among E’s demographics. Lana complained about the editing on the show that was either inaccurate or portrayed them badly while noting it’s what they signed up for but she was audibly emotional when describing what happened to them. **The WWE stock closed at $87.25 on Tuesday. **The UFC did another strong number on ESPN Saturday with the help of a big lead in. The UFC 234 preliminary card averaged 1,339,000 viewers featuring Devonte Smith defeating Callan Porter in the featured bout. The card was assisted by the Duke vs. Virginia college basketball that averaged 3,318,000 viewers. It’s a major benefit to the UFC to have this level of lead in programming. This Sunday’s card is a big one as it’s the first full card on ESPN with the prelims at 7 pm and the main card at 9 pm. The earlier portion will go against the NBA All-Star Game, which starts at 8 pm. The main event features Cain Velasquez returning for his first fight since 2016 against Francis Ngannou. **Daniel Cormier was a guest on The MMA Hour with Luke Thomas on Monday. Cormier has been dealing with a freak injury after a sneeze caused an injury to his back from November and is still dealing issues from it. He blamed the injury on how quickly he had to get ready for his fight with Derrick Lewis with three weeks to prepare for the fight. Cormier was offered a chance to fight on March 2nd but didn’t receive an opponent. Cormier is extending his deadline for retirement, initially stating he would be done by his 40th birthday in Match as he is now pushing it at least to the summer. He is still hopeful his next fight will be against Brock Lesnar and if not Lesnar, it will probably be against Stipe Miocic but included the possibility of fighting Jon Jones one more time at light heavyweight. **PFL heavyweight Josh Copeland has been indefinitely suspended by the organization following an arrest earlier this month and ongoing investigation. TMZ reported that Copeland was taken into custody on February 2nd and booked for second-degree assault, obstruction of telephone service and criminally negligent child abuse after allegedly striking his wife in front of the couple’s child. TMZ obtained the police report that stated authorities arrived at their home and Copeland’s wife had “an obvious bruise on her left eye, a cut and was bleeding.” In the statement, Copeland’s wife said the two were arguing with Copeland pushing her and she pushed back, she also added she slapped him twice that led to her being punched in the face with Copeland leaving with her phone. The police added that Copeland did not remember punching her. The fighter will be in court on March 1st for a preliminary hearing. **The UFC has announced that the UFC 238 pay-per-view will take place from the United Center in Chicago on Saturday, June 8th. **Ismail Naurdiev will replace the injured Ramazan Emeev on the UFC’s Fight Night card on February 23rd in the Czech Republic against Michel Prazeres. Naurdiev will make his UFC debut with a 17-2 record after debuting in 2012. After going 14 months without a fight, he returned earlier this month and defeated Paulistenio Rocha with a 36-second stoppage at XFN 16 in Austria. Prazeres doesn’t get talked about nearly enough as he’s on an eight-fight win streak dating to November 2015 and is 10-1 since September 2013 inside the UFC with an overall record of 26-2. His biggest obstacle was making weight when he fought at lightweight as he missed the mark on three occasions before returning to welterweight for his last two fights. **Bellator will stage its second European series card on Saturday, May 4th in Birmingham, England. The main event will see former lightweight champion Brent Primus attempt to rebound for his championship loss to Michael Chandler when he fights promotional newcomer Tim Wilde. The veteran of Cage Warriors and BAMMA holds a 12-3 record and has won his last three fights. **Reporter Rodney James Edgar of MMA Latest broke the news that Luis Pena is set to fight Steven Peterson on the UFC on ESPN + 6 card on Saturday, March 23rd in Nashville, Tennessee. The 25-year old Pena came off the 27th season of the Ultimate Fighter and became synonymous with his nickname of “Violent Bob Ross”, going 1-1 in his UFC tenure thus far. Pena last fought in November where he dropped a split decision to Mike Trizano. Peterson is a veteran of LFA and entered the UFC last year dropping a decision to Brandon Davis and rebounded with a split decision victory over Matt Bessette in July. John Pollock and Phil Chertok review UFC 234 from Melbourne with Israel Adesanya vs. Anderson Silva after losing the main event due to Robert Whittaker undergoing emergency surgery. John Pollock and Wai Ting are joined by Wrestlenomics / Fightful’s Brandon Howard Thurston to discuss WWE’s Q4 and full year 2018 earnings reports which shed a lot of light on Crown Jewel, WWE Network, live event attendance and other indicators of success for the company in 2018. John Pollock & Wai Ting review the seventh Marvel Cinematic Universe film, Iron Man 3 (2013). We discuss why director Shane Black took over for Jon Favreau, the performance of Robert Downey Jr. as a PTSD-suffering Tony Stark following the events of The Avengers, the controversial swerve involving Ben Kingsley’s The Mandarin, and more. John Pollock and Wai Ting react to All Elite Wrestling’s press conference in Las Vegas with Kenny Omega’s signing, match announcements, and more names added for Double or Nothing. Braden Herrington & Davie Portman review this week’s edition of WWE NXT including Drew Gulak vs. Matt Riddle, Sky Pirates & Bianca Belair vs. Baszler, Duke & Shafir, and the debut of a very… interesting jobber. Martin and Benno are joined by Will Cooling of Fighting Spirit Magazine to talk Progress Chapter 83 (CCK vs. Swords Of Essex), NXT UK (Walter debut), WWE Worlds Collide (Tyler Bate vs. Adam Cole), OTT Contenders 13 (Devlin vs. A-Kid) and Pro Wrestling Eve resurrecting the Battlebowl concept for their latest show.